At the end of the month, the Smithsonian Libraries will open Color in a New Light, a new exhibition highlighting the role of color in our lives, from science to fashion and everything in between. Even if you’re not able to visit the show in person in the National Museum of Natural History , we invite you to join us as we explore color through several interactive social media events. 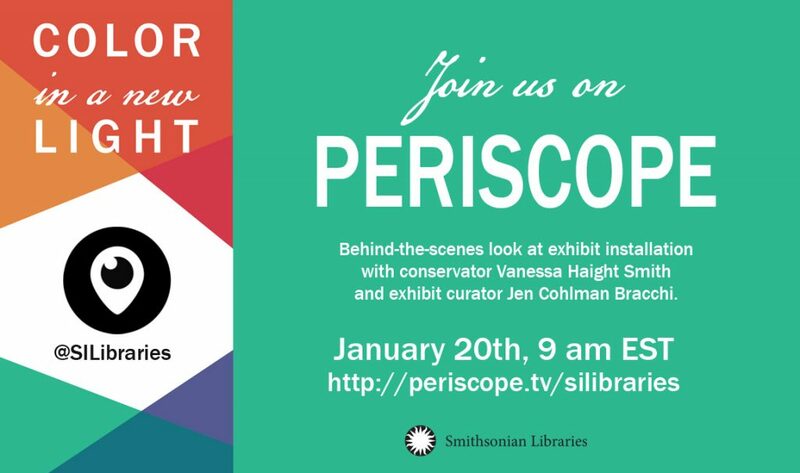 On January 20th at 9 am (EST), tune in as we chat with Head of Preservation Services Vanessa Haight Smith and exhibit curator Jen Cohlman Bracchi. We’ll get a sneak peek at the exhibition and learn more about the conservation work that goes in to putting books on display. To watch, follow us on the Periscope app at @SILibraries or by using this link. The broadcast should be available for viewing for 24 hours after the event. On February 4th from 1-2 pm (EST), the Libraries will host Benjamin Moore color expert Carl Minchew on Twitter for a chat about all things color. He’ll be joined by curator Jen Cohlman Bracchi. 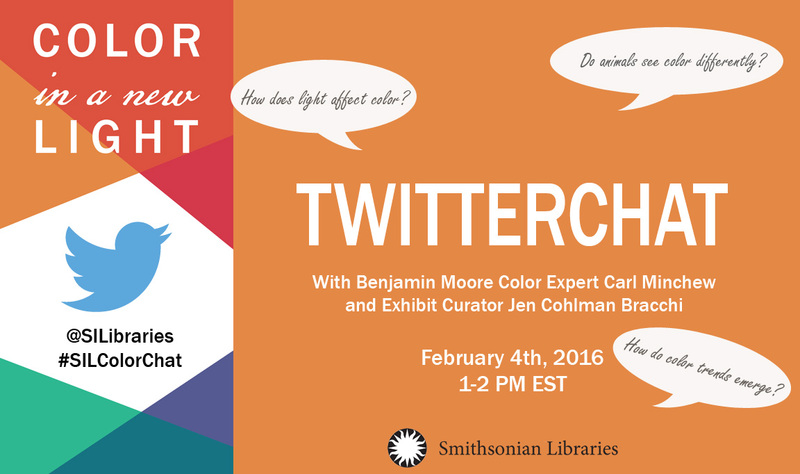 Twitter users can send us their questions before or during the event using hashtag #SILColorChat. We’re excited to take you behind-the-scenes and explore this fascinating topic. Stay tuned for more exhibition information and events! And if you just can’t wait to learn more, take a look at the color-related books available in our Digital Library. 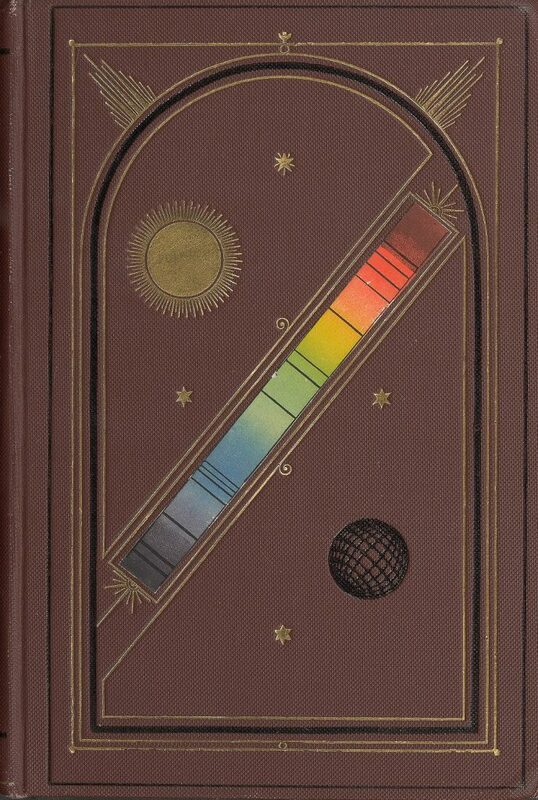 Cover of Spectrum analysis six lectures delivered in 1868 before the Society of Apothecaries of London, available in our Digital Library. Color in a New Light is made possible by generous support from lead sponsor Benjamin Moore.